Compliant with ONFI 2.3/3.0/4.0/4.1 specifications. Supports Source Synchronous and Asynchronous data interfaces. Supports Implicit DCC Training commands. Supports Read DQ Training commands. Supports Write TX DQ Training Pattern commands. Supports Write TX DQ Training Read back commands. Supports Write RX DQ Training commands. Configurable timing modes for all data interface. Supports Partial Page programming and copy back programming. Supports Small Data Move command for both Program and Copyback operations. Ability to generate Vendor Specific Commands and Block Abstracted NAND Commands. 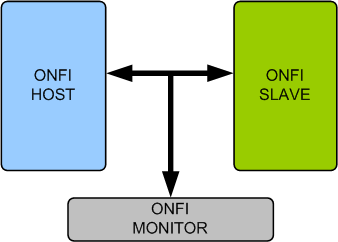 Rich set of configuration parameters to control ONFI functionality. Supports SDR, DDR, NV-DDR2, NV-DDR3 data interface. Protocol checker fully compliant with ONFI Specification with versions 2.3/3.0/4.0/4.1. ONFI Verification IP comes with complete testsuite to test every feature of ONFI specification. SmartDV's ONFI Verification env contains following. Complete regression suite containing all the ONFI testcases.